Vivek Subramanian received his BS in electrical engineering from Louisiana State University in 1994. He received his MS and PhD in electrical engineering, in 1996 and 1998 respectively, from Stanford University. Dr. Subramanian co-founded Matrix Semiconductor, Inc., in 1998. 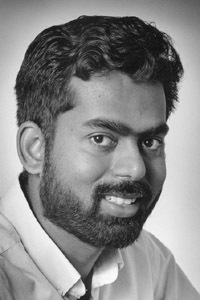 Since 1998, he has been at the University of California, Berkeley, where he is currently a Professor in the Department of Electrical engineering and Computer Sciences. His research interests include advanced CMOS devices and technology and polysilicon thin film transistor technology for displays and vertical integration applications. His current research focuses on organic electronics for display, low-cost logic, and sensing applications. He has authored or co-authored more than 40 research publications and patents. Dr. Subramanian is a member of the Institute of Electrical and Electronic Engineers (IEEE) and has served on the technical committee for the Device Research Conference and the International Electron Device Meeting. In 2002, he was nominated to Technology Review's list of top 100 young innovators (the TR100), ), and his work at Matrix Semiconductor was nominated to the Scientific American SA50 list for visionary technology. In 2003, he was nominated to the National Academy of Engineering's "Frontiers of Engineering", and was awarded a National Science Foundation Young Investigator Award (CAREER). Vivek resides in Orinda, CA with his human, canine, and feline family. He enjoys woodworking, driving his electric vehicle and is an active advocate of alternative transportation solutions and animal rights. He enjoys playing touch football and squash.